The other day, it took me about 3 hours to do 15 minutes’worth of dishes. Because every two or three minutes I had to go nurse, or go change the venue of play, or put the baby in the ergo on my back, or take a shower, or whatever. I would pop back in, throw a few things in the dishwasher and then have to go help Shad with something. And that has been about the summary of life lately. No better things to be doing with my time than responding to my family’s varied needs like a shotgun blast – just hoping that I hit more than I miss! I am no stranger to the wilds of life at home with littles. I’ve been here and done this before even if this time around does have a little extra sauce on top. Through the years I have developed the habit of laughing at (and enjoying) the downright bonkers side of it. The laundry just will be epic. The floor just will need to be swept at all times. The crayons will always be out. The books will be on our floors as though they came to us in a sudden hailstorm. The need to feed people will be constant, and the need to never sit down will remain with me for probably the rest of my life. And I am okay with that and I love it. But here is the thing. Sometimes my coping mechanism of humor fails me. Sometimes I just don’t really think it is funny. Or just not funny enough. Or it feels a little too much like the knock-knock joke that just won’t ever say orange. It is at this point that I usually either cry or get annoyed. It would probably be better for us all if I would just cry because then I could pull out of that by laughing and possibly even make it through the whole crisis without indulging in sin. So one morning I drew a line. I will see Jesus in this. I cannot be the annoyed and tedious person that I keep running into. I will, whatever it takes, see Him. So I sat down in my pajamas too late to be in pajamas, and the baby was playing on a blanket in just his diaper, the breakfast dishes were out to play still, and you could see the remains of the blowout carnage waiting to go down to the laundry room for stain treatment. The vacuum was sprawled out across the living room like so many broken dreams, and Shad was playing something that involved moving the benches and chairs from the table across the room, along with one million sheets of paper and pencil sharpening fragments. And I sat down with my Bible to start my normal reading. And let me tell you, I have never in my life felt such a bond of solidarity with Zacchaeus. Here I was being frustrated with all the crowds of little things getting in my way. I wanted to see Jesus, I wanted to have joy, I wanted to be at peace and not in my little nest of pettiness. And you know what was so great? Jesus wasn’t just passing by out in the distance. I felt exactly as if He looked at me and said, “Rachel. Get out of that dumb tree. I am coming to your house today.” And luckily, because Zacchaeus did this correctly, I knew what to do. Receive Him joyfully. The thing is, Zacchaeus really was short. There really was a crowd. There really are reasons to sometimes feel like you are out of the loop. Like you need encouragement. Like Jesus might just walk on past because He has a lot of work to do elsewhere. People are needy all over the place. I’m just regular old me messing around with lame attitudes and sippy cups, and there ain’t nobody got time for that! Amen. Amen. Amen. And since He is here, let us all receive Him joyfully. Every day. Every not-showered in a timely manner and nursed out of your brains day. Every too many errands and not enough naps day. Every beautiful, messy, fruitful, glorious, sticky, wild, breathless, regular day. Because we have the best of all possible companions, and the best of all possible guests. The Lord Jesus Christ – not passing us by, but staying with us. Forever. And Amen. I love your heart for your family. Thank you sister, for your candor in sharing and also for the example of not being satisfy with good but wanting the best. A sweet friend sent this to me today, and I could not be more thankful. Just beautiful and true and all the thing to point me back to the Jesus I desperately need. Thank you! I loved this! Thank you for taking time to write and bless us readers! And did you really say the Pam-ing my hands bit? Hilarious and such a perfect visual!! Grateful to see another who’s 7th decided that napping was for the birds. After 6 I was pretty pleased with myself in the particulars of schedules and getting sleep to happen. Number 7 proved that I had had very little to do with the successful slumber of my former children. She is just wired for sound which is funny because my Mother had said that I was the same and I had had the gall to think she had been inept! I did say that! At that exact moment I must have been coping with humor still, haha! Aaahh, so very encouraging. Thank you for looking up from the chaos and sharing your heart and perspective. I certainly needed to hear it today! Always timely. Thank you for your funny yet encouraging words. Definitely, the Lord needs to be first in our lives, though. Bless your honest heart! This was a joy to read. It challenged me and made me cry. Real. Life. Thanks, Rachel. I needed this this week. “So one morning I drew a line. I will see Jesus in this. I cannot be the annoyed and tedious person that I keep running into. I will, whatever it takes, see Him.” No victims here- only the utterly dependent on Christ. You help me keep standing firm. Thanks for squeezing in some encouragement. I just had my 3rd! So this was encouraging for me as I am also trying to “get a grip” on things!!! 🙂 thank you for sharing!! Love the Zaccheaus application. 5 including a 5 mo. old, makes for many moments requiring this perspective…. thank you for sharing! Thank you for this. I often don’t find it funny, so this is a timely challenge to me. 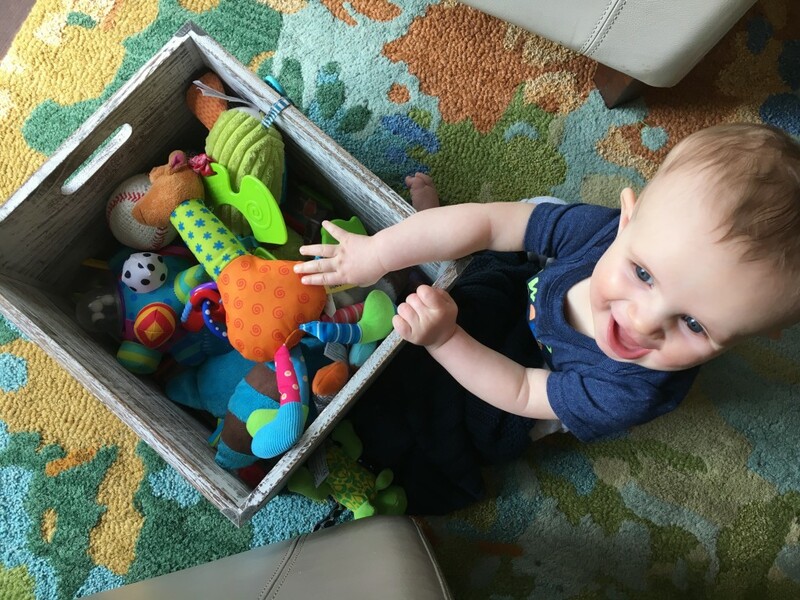 Our son Zach may be the only Zach in the world named after the short tax collector who nobody liked 🙂 And ‘the knock-knock joke that just won’t ever say orange’ – the perfect simile for parents of little ones! Banana banana banana, sigh. Well done you and thank you Jesus for being here always. I am fighting to emerge from my aggravation with my little people just being little people. I needed a Lizzie Jank kick in the pants and reminder to lean in to the one that is always there. Please keep writing! I check daily. U ladies have been the lords life line to many days over the last 5 or so years!! I can picture the whole scenario you described with the breakfast dishes and little one moving chairs and the wayward vacuum! It could be my house – the things left untouched strewn about and other things getting relocated for a few moments of what is so much more important! Thank you for this – read it at an almost midnight feed with #6 and will fall asleep now so encouraged to keep seeing Jesus. Thank you for sharing your heart and God’s truth with us. This was such an encouragement to me today! I needed reminders that Jesus is with me and I should receive him joyfully. Thank you for writing again! Needed those reminders.